The crash in the cryptocurrency market continued unabated on Friday, with Bitcoin falling below $7,600 temporarily before recovering somewhat to close at $8,385. 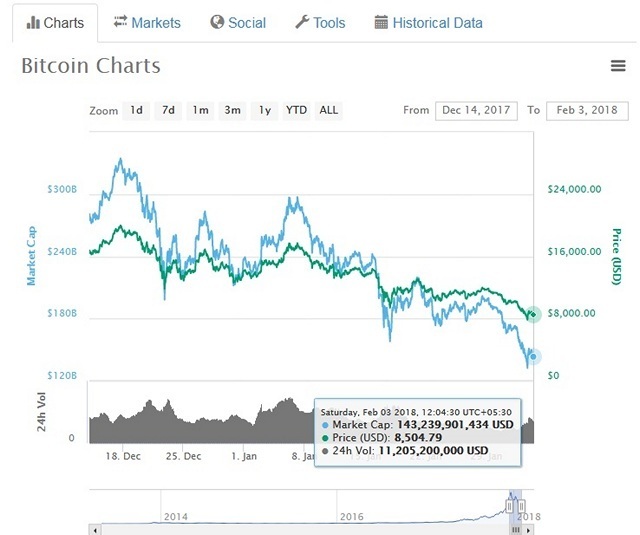 This marked the first time the world’s leading cryptocurrency fell below the $8,000 level since November 24. According to CoinMarketCap, the bloodbath at the cryptocurrency market has resulted in $115 billion being wiped off in just 24 hours, with leading digital assets, like Ethereum, Ripple and Bitcoin Cash falling by as much as 32 percent, 38 percent, and 27 percent respectively at one stage. It’s worth noting here that cryptocurrencies grew at a breakneck speed over the past several months, with Bitcoin leading the pack by hitting the $20,000 mark just a few weeks back, even as many analysts kept warning about a possible crypto bubble. Notable cryptocurrency skeptics include Berkshire Hathaway Chief Executive Warren Buffett, who recently said that he thinks the crypto-mania will end badly for everyone. J. P. Morgan Chief Executive Jamie Dimon also once called Bitcoin a fraud, although, he’s since changed his position on the issue, saying that he regrets his earlier statement. Some of the other possible reasons that are being cited for the continuing collapse of the cryptocurrency market include China’s massive regulatory crackdown on digital currencies, and the repeated talks from senior South Korean politicians about criminalizing cryptocurrencies, although, the country’s government seems to have since backtracked somewhat on the issue. Indian Finance Minister Arun Jaitley also recently said that the country’s “Government does not consider cryptocurrencies legal tender”. To add to all of that, Facebook recently banned ads promoting cryptocurrencies and ICOs (initial coin offerings) and major US banks are banning the purchase of cryptocurrencies with credit cards. However, one of the biggest blows to the cryptocurrency market came earlier this week when Bloomberg reported about the U.S. Commodity Futures Trading Commission investigating Bitfinex and Tether for alleged price manipulation. Of course, the recent $500 million heist at Japanese exchange Coincheck isn’t helping matters either.